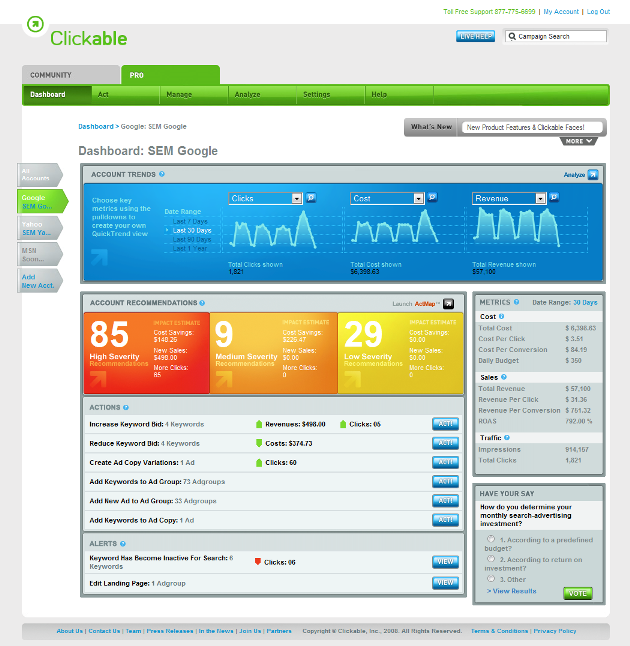 Clickable is debuting version 2.0 of its search advertising management suite today, adding to the software a slew of features that should make it easier for small and medium-sized businesses to stay on top of online marketing campaigns held across a variety of advertising networks such as Google, Yahoo and MSN. While it was already possible for Clickable users to import different accounts in order to manage their campaigns from an interface designed to make them more intuitive and effective, Clickable Pro 2.0 now enables them to consolidate management of multiple search advertising campaigns across advertising networks from one central location. To achieve this, Clickable has added features like bulk editing and filtering of keywords which allow agencies and advertisers to rapidly search, edit and export high volumes of keywords across all advertising networks and accounts, as well as a recommendation engine that should allow advertisers to make search campaigns more effective. Clickable Pro 2.0 also adds beta support for what it dubs Emerging Google Ad Formats, meaning less standard media placements like image ads (banners), local business (maps) and mobile (text and image) ads. In addition, the company has now added its Conversation Tracking feature, previously in beta, to the Clickable Pro interface in order to make it easier for advertisers and agencies to track and measure campaigns. Management tools like Clickable come in handy for agencies managing search advertising budgets for multiple clients, as well as business owners who choose to advertise across different ad networks. These days, basically everyone should be looking to optimize their online advertising efforts to the maximum, and Clickable gives new customers a 15-day free trial to test the waters and see if their software suite helps generate more ROI. Pricing for Clickable Pro is set to 5% of the total monthly ad spend for campaigns exceeding a cost of $2,500, or a fixed $129 per month for those who manage to keep their cost under that amount. Clickable is based out of New York and has raised a total of $20.5+ million in funding to date, most recently a $14.5 Series B round led by Founders Fund, Union Square Ventures, and FirstMark Capital.